This builds upon the previous post, where we looked into log files produced by Galera (error log and innobackup. * logs). We discussed how regular, “normal” activity looks like - from initialization of Galera replication to Incremental State Transfer (IST) and State Snapshot Transfer (SST) processes, and the respective log entries. This is an example of an issue related to lack of Primary Key (PK) in a table. Theoretically speaking, Galera supports InnoDB tables without a PK. Lack of PK induces some limitations, for e.g. , DELETEs are not supported on such tables. Row order can also be different. We’ve found that lack of PK can also be a culprit of serious crashes in Galera. It shouldn’t happen but that’s how things look like. Below is a sample of error log covering such crash. 2015-04-29 11:49:38 49655 [Note] WSREP: wsrep_notify_cmd is not defined, skipping notification. InnoDB: is in the future! Current system log sequence number 207818416901. Here’s the hint we are looking for: ‘GEN_CLUST_INDEX’. InnoDB requires a PK to be available - it uses PK as a clustered index, which is the main component of a table structure. No PK - no way to organize data within a table. If there’s no explicit PK defined on a table, InnoDB looks for UNIQUE keys to use for clustered index. If there’s no PK nor UNIQUE key available, an implicit PK is created - it’s referred to by InnoDB as ‘GEN_CLUST_INDEX’. If you see the entry like above, you can be sure that this particular table (db.tab) doesn’t have a PK defined. In this particular case, we can see that some kind of lock conflict happened. In the section above you can find information about the record involved in the locking conflict. We obfuscated the data, but normally this info may point you to a particular row in the table. Apparently, while scanning our ‘db.tab’ table, something went wrong and MySQL crashed. From our experience, in such cases, it’s enough to create a PK on the table. We don’t recall issues which persist after that schema change. In general, if you don’t have a good candidate for a PK on the table, the best way to solve such problem would be to create a new integer (small/big - depending on the max expected table size) column, auto-incremented, unsigned, not null. Such column will work great as PK and it should prevent this type of errors. Please keep in mind that for tables without PK, if you execute simultaneous writes on multiple Galera nodes, rows may have been ordered differently - this is because implicit PK base on id of a row. Such ID increases monotonically as new rows are inserted. So, everything depends on the write concurrency - higher it is, more likely rows were inserted in different order on different nodes. If this happened, when you add a Primary Key, you may end up with table not consistent across the cluster. There’s no easy workaround here. The easiest way (but also most intrusive) is to set one node in the cluster as a donor for the rest of it and then force SST on remaining nodes - this will rebuild other nodes using single source of truth. Another option is to use pt-table-sync, script which is a part of the Percona Toolkit. It will allow you to sync chosen table across the cluster. Of course, before you perform any kind of action it’s always good to use another Percona Toolkit script (pt-table-checksum) to check if given table is in sync across the cluster or not. If it is in sync (because you write only to a single node or write concurrency is low and issue hasn’t been triggered), there’s no need to do anything. Galera Cluster requires quorum to operate - 50%+1 nodes have to be up in order to form a ‘Primary Component’. This mechanism is designed to ensure that a split brain won’t happen and that your application does not end up talking to two separate disconnected parts of the same cluster. Obviously, it’d be a very bad situation to be in - therefore we are happy for the protection Galera gives us. We are going to cover a real-world example of the network split and why we have to be cautious when dealing with such scenario. Two nodes (id’s of 428eb82c and d272b968) were declared inactive and left the cluster. Those nodes, in fact, were still running - the problem was related only to the network connectivity. This cluster consists of four nodes. Therefore, as expected, it switched to Non-Primary state as less than 50%+1 nodes are available. 150529  9:30:05 [Note] WSREP: Received NON-PRIMARY. 150529  9:30:05 [Note] WSREP: wsrep_notify_cmd is not defined, skipping notification. Above you can see a couple of failed attempts to bring the cluster back in sync. When a cluster is in ‘non-Primary’ state, it won’t rejoin unless all of the nodes are available again or one of the nodes is bootstrapped. What we have here is a standard startup process for galera. Please note that the cluster consists of three nodes. 2015-11-04 16:52:20 18033 [Note] WSREP: STATE EXCHANGE: Waiting for state UUID. 2015-11-04 16:52:20 18033 [Note] WSREP: Waiting for SST to complete. So far so good, nodes are communicating with each other. 2015-11-04 16:52:20 18033 [ERROR] WSREP: gcs/src/gcs_group.cpp:group_post_state_exchange():319: Reversing history: 0 -> 0, this member has applied 140700504171408 more events than the primary component.Data loss is possible. Aborting. 2015-11-04 16:52:20 18033 [Note] WSREP: /usr/sbin/mysqld: Terminated. Unfortunately, one of the nodes was more advanced that the node we bootstrapped the cluster from. This insane number of events is not really valid, as you can tell. It’s true though that this node cannot join the cluster. The only way to do it is by running SST. But in such case you are going to lose some of the data which wasn’t applied on the node you bootstrapped the cluster from. The best practice is to try and recover this data from the ‘more advanced’ node - hopefully there are binlogs available. If not, the process is still possible but comparing the data on a live system is not an easy task. 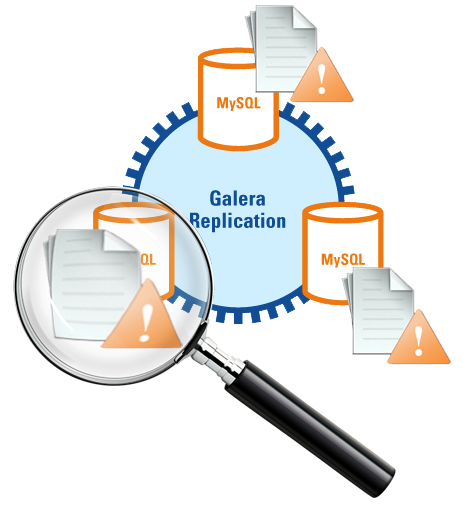 Within a cluster, all Galera nodes should be consistent. No matter where you write, the change should be replicated across all nodes. For that, as a base method of moving data around, Galera uses row based replication - this is the best way of replicating data while maintaining consistency of the data set. All nodes are consistent - this is true most of the time. Sometimes, though, things do not work as they are expected to. Even with Galera, nodes may get out of sync. There are numerous reasons for that - from node crashes which result in data loss to human errors while tinkering around replication or ‘wsrep_on’ variables. What is important - Galera has an internal mechanism of maintaining consistency. If it detects an error while applying a writeset, a node will shut down to ensure that inconsistency won’t propagate, for example through SST. By looking at the error log, this is how things will look like. If you are familiar with row based replication, you may have seen errors similar to the one above. This is information from MySQL that one of the events cannot be executed. In this particular case, some update failed to apply. Here we can see the Galera part of the information - writeset with sequence number of 563464 couldn’t be applied. To avoid transient errors (like deadlocks, for example), the writeset has been re-executed four times. It was a permanent error this time so all attempts failed. With failure to apply the writeset, the node was determined inconsistent with the rest of the cluster and Galera took an action which is intended to minimize the impact of this inconsistency - the node is going to be shut down and it won’t be able to join the cluster as long as this writeset remains unapplied. 2015-11-12 15:35:59 5071 [Note] WSREP: Closed send monitor. 2015-11-12 15:35:59 5071 [Note] WSREP: Received NON-PRIMARY. 2015-11-12 15:35:59 5071 [Note] WSREP: Received self-leave message. 2015-11-12 15:35:59 5071 [Note] WSREP: Received SELF-LEAVE. Closing connection. 2015-11-12 15:35:59 5071 [Note] WSREP: recv_thread() joined. 2015-11-12 15:35:59 5071 [Note] WSREP: Closing replication queue. 2015-11-12 15:35:59 5071 [Note] WSREP: Closing slave action queue. 2015-11-12 15:35:59 5071 [Note] WSREP: /usr/sbin/mysqld: Terminated. What follows is the regular MySQL shutdown process. This concludes the first part of our troubleshooting blog. In the second part of the blog, we will cover different types of SST issues, as well as problems with network streaming.